Steven Goetz (aka Goatman) sent in a review of Gas Cubby Free, Allister came through with an unsolicited testimonial for Hover, Knightwise reviews the inventive and interesting Yota-Phone, Door tells about the CuBox-i2ex and in Dumb Question Corner, Steve answers Timo from Finland’s question about 1s and 0s. In Chit Chat Across the Pond Bart takes us through Taming the Terminal Part 26 of n all about DHCP. Hi this is Allison Sheridan of the NosillaCast Mac Podcast, hosted at Podfeet.com, a technology geek podcast with an EVER so slight Macintosh bias. Today is Sunday December 28, 2014 and this is show number 503. This week is a perfect example of how the community for the NosillaCast comes through for me. We had a 13 step process to celebrate Christmas this year – starting on December 23rd and extending to December 28th (today), shuttling five family members and 2 dogs through 5 Christmases, 5 cities and even a trip to the airport. We skidded around the corner into our driveway less than 2 hours ago so without the community you’d be listening to dead air right now! Bart agreed to do Chit Chat Across the Pond almost a week early with Taming the Terminal Part 26 of n all about DHCP which was REALLY interesting to me. Steven Goetz (aka Goatman) sent in a review of Gas Cubby, Allister came through with an unsolicited testimonial for Hover, Knightwise reviews the inventive and interesting Yota-Phone, Door tells about the CuBox-i2ex and in Dumb Question Corner, Steve (he calls himself Husband Steve) agreed to answer our Dumb Question from Timo from Finland. What’s that song say, “I get by with a little help from my friends”? During Chit Chat Across the Pond you’re going to hear Bart ask for feedback on what kind of changes you’d like to see in Security Lite. He’s questioning where the value is, what you guys like or don’t like about the segment. He posted the question in our Google Plus community over at podfeet.com/googleplus and he’s already gotten a ton of great feedback about it. I put a link in the shownotes so you can jump in and let him know what you think. This is a great reason to get into our Google Plus community while you’re at it. If you want to be notified when things are posted in there, just make sure to click on the little bell symbol right above the logo on the left side. You can turn it off at any time which is nice. I find the community just chatty enough but not too chatty! Hope you’ll come over and let Bart know what you think of Security Light. Hi, my name is Steven Goetz, and I would like to review the iPhone app Gas Cubby for you. But first, the problem to be solved. My car has a turbo charged, high compression engine, and the manufacturer recommends we use premium fuel. The manual does state that regular fuel can be used, but we may experience a loss in power and fuel mileage. In my area, premium fuel can be quite a bit more expensive than regular gas. I wanted an iPhone app that would let me track and record my car’s mileage. Gas Cubby is a free, ad supported app that has been around for a long time. It features support for multiple vehicles, tracking of fill ups, and service costs, support for imperial, metric and US measurements. You can also set up alerts that would let you know when it’s time to get an oil change, or other regular service. It will also graph out your fuel mileage, allowing you to see trends, in your fuel use, or if gas from different stations, or of different grades effect your mileage. I haven’t been using it long enough to see if the regular gas will indeed give me less mileage making the switch from premium a draw cost wise, but I do feel that once I get enough data into the app it will be useful. You can also export all your entered data into a .CSV file for use in your spreadsheet of choice, or for importing into another mileage tracking app, or into the very useful website Fuelly, which not only allows you to track your vehicles mileage, but you can compare your mileage to other users who drive the same make and model. There is room for improvement, first the UI is very dated, it very much feels like an iOS 3 app. I also wish there were ways to turn off info fields that appear when adding a fill up. Some people may find fields like location, brand, payment type & tire pressure useful, I personally don’t, and they make the UI more cluttered than necessary. If you find the ads intrusive you can buy an ad-free version, and import your data with a built in feature which allows you to upload your data to the Gas Cubby server which provides a back up of your data. So in the end, I would recommend this app for anyone who wants to track the mileage, or service visits of 1 or more vehicles. Please visit www.stevengoetz.ca for my blog, and to check out my photography, thanks for listening and good bye for now. Thanks Steven, this sounds like fun. You know what a metrics nerd I am! By the way folks, if you’re looking for this app, be sure to search on Gas Cubby Free. You can try that first and if you want to upgrade you can find Gas Cubby for $2 in the App Store. Like Steven, the reviews on iTunes are kind of hot and cold on Gas Cubby. For free it’s not a risk, but for some reason the paid for version in it’s latest release is getting some pretty harsh reviews, while their all time reviews are 4 stars. Hope Gas Cubby Free will do what you’re looking for. Hello Allison and the NosillaCastaways. Allister here from New Zealand once again with a word from, err, about our sponsor. No, not that sponsor, the other one. I became a customer of Hover in June 2011 when I first registered my macthoughts.net domain. I don’t recall how I heard about them but I think it was from a podcast I had been listening to. The promise was simple: affordable, simple, no up-sell. Three and a half years later, that promise is still being delivered upon. I now have 17 domains with Hover. When I first became a customer they didn’t offer any .nz domains but since then they have added many of our standard second level domains and have promised me there are more coming. I’m transferring everything I can across from my previous, New Zealand-based registrar just as soon as I can. Just recently, New Zealand opened up the second level to allow any domain to end with .nz and while trying to secure one of these I experienced what Hover customer service is. Many of you will know my online ‘handle,’ zkarj. The very first domain I bought was zkarj.co.nz which I’ve had since 2001. I had transferred this to Hover some time ago and now needed to prove I owned it in order to register the new zkarj.nz. Unfortunately these domains are so new, Hover cannot provide them for me so I needed to register the new domain with my New Zealand registrar. This process involves a unique code that Hover would generate. It is variously called an Authorization code or UDAI. I located the code on my Hover account and set about proving my ownership. Entering the code provided by Hover, I got an error that the code was not accepted. I double and triple-checked and kept getting the same error. I checked with the New Zealand registrar and they just said “we can’t help, your registrar needs to provide the correct code.” Time for Hover support. The first response was from Rodger, who confirmed what I was doing should work but I needed to perform another step on Hover. I tried this and got another error on Hover. I emailed this back to Rodger. The next day another response from Rodger began “I’ve done some further investigation…” and went on to describe some recent changes in the .nz registry rules and how it appeared my (original) domain had been caught up in these changes. He had made some changes behind the scenes and asked me to try again. Another error! I responded again and noted something I had come across at the old registrar about the exact makeup of the code. Rodger responded once more, beginning “I’m not sure exactly what’s happening…” and continuing to describe how he had researched the .nz domain rules himself and believed everything should be in order, but he had escalated my problem within Hover. In the end it took a couple of weeks for them to get to the bottom of the problem, but throughout that time I got several updates from Rodger about what was happening until finally he emailed me and said a brand new code had been generated and could I please try it. It worked! Now you might think the takeaway from this episode is that Hover had the wrong code and couldn’t figure out how to generate the correct one, but I take another view. I dealt with exactly one person at Hover. Rodger. He was speaking to me at the same level as I was speaking to him. None of this “turn it off and on again” nonsense or scripted answers, just straight talk at a reasonably technical level that I had illustrated I could understand. He kept me updated as soon as anything changed, even if there was no resolution yet or further steps for me to take. Every update gave me more information on what was happening, what their thinking was and whether I needed to do anything or provide any more information. When I finally responded that it had worked, I got a cheery response from Rodger who seemed as glad as I was that it was resolved. Most of the time I find Hover incredibly simple to use, but domain names can be complicated and it is comforting to know the people behind the scenes can be so tenacious at rooting out a complex problem such as this. I cannot recommend them enough. Thank you so much Allister for this testimonial! I have gotten so many emails and tweets endorsing Hover, I’m glad to have them support the show. Remember this is the LAST week to use the coupon code XXXXXXX to get 10% off for new customers over at hover.com. This phone sounds like it’s breaking some new ground, Knightwise, but dang is that baby expensive! I put a link in the shownotes to the Yota-phone at Amazon and it’s listed for just under a thousand dollars! I love stuff like this, Door, such a cool idea and so simple! Thanks for sending it in. I’ve asked Steve to come on and answer our Dumb Question this week because it was out of my league! Listener Timo from Finland sent in the following dumb question that he says was inspired by “all of the Taming the Terminal episodes.” Timo asks the following question: “I know that computers ultimately only understand binary code, i.e. ones and zeroes. But what are ones and zeroes exactly? Since numbers are a human abstraction I don’t expect to see little 1’s and 0’s zipping around a computer chip if I put a working motherboard under a microscope. Physically, what do the ones and zeroes of code actually represent in the internal workings of a computer? Well Timo, it’s good to see Taming the Terminal has inspired you to question how computers actually work and your question is a good one. You are quite correct, you won’t see microscopic 1’s and 0’s buzzing around your computer’s CPU if you examine it with a microscope. But with a very good microscope you can see the electronics, namely the transistors, that actually make the 1’s and 0’s. To better answer your question, let’s back up a little to talk about what a computer chip really is and what is does. The transistor is the fundamental building block of nearly all modern day computers. A transistor is the collection of electronic circuitry that implements the 1’s and 0’s in a digital computer. A transistor can change its output voltage (and current) based on a control signal coming into it. Think of a transistor like water valve where the water flow is the output voltage and the faucet handle is the control signal. Originally transistors were discrete devices (i.e. one transistor to a package) that you soldered onto an electronic circuit board. As technology moved along transistors were made smaller and integrated into a single package called an integrated circuit. As they got smaller they also required less power and they became faster. Technology has now advanced to the point that billions of transistors can fit on a single computer chip. For example, Apple’s A8 dual-core microprocessor that you find in an iPhone 6 & 6 Plus has 2 billion transistors embedded in a single chip measuring just under one centimeter on each side. In order for your computer to make decisions and carry out calculations, these billions of transistors are wired together in various combinations in an integrated circuit to create logic gates like the “AND” and “OR” functions. A logic gate takes as its input two logic values, either of which can be a 1 or a 0, and outputs a 1 or a 0, depending on the gate’s particular function and its input values. The 1’s and 0’s on the input and output of a logic gate are actually indicated by small voltages on the input and output of the transistors that make up the logic gate. These voltages are very small, on the order of 2 to 5 volts depending on the semiconductor design. For this example let’s pick 3 volts as the operating voltage for our transistors and logic gates. A logic 1 then is indicated by 3 volts while a logic 0 is indicated by 0 volts as measured at the transistor’s inputs and outputs. So in answer to your question, the 1’s and 0’s zipping around your computer chip are represented by very small voltages on the input and output of the billions of transistors in your computer’s CPU. Thanks for sending in your question Timo – hope I’ve helped to answer it. Oh, and be sure to stay subscribed. Thanks for answering, Husband Steve, I had a vague idea of a little bit of that but I sure learned a bunch more from your explanation. I think If I’d been the one to answer my full explanation would have been, “it’s not 1s and 0s, it’s some voltage and then some not voltage.” And that’s why our marriage works so well, we complement each other’s skills! For Christmas, Dorothy (aka MacLurker) bought her father and step-mother an iPad for Christmas. 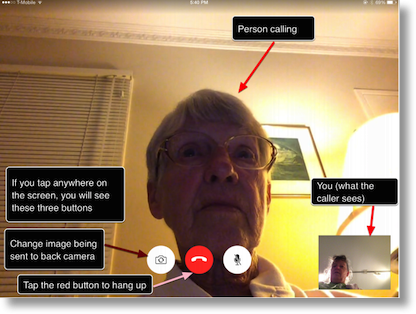 The main idea is for them to be able to converse with their grandchild over FaceTime. The computer and Skype is a bit too much for them at this point so an iPad seemed like a good solution. Dorothy knows her dad and decided that if she tried to teach him too much stuff (look, Dad! There’s apps! and Email! and you can Tweet!!!) he’d just hide the iPad under a book and pretend he lost it, so she figured if could just get him to FaceTime it would be a victory and maybe eventually he’d have some curiosity on what else this new fangled contraption could do. She did go to his house and teach him how to use it, but that wouldn’t be enough. She decided to use Clarify to make him a very simple tutorial showing him what it would look like when someone called, what button to push and how to even initiate a call himself. She took screenshots of her own iPad, dropped in some lovely rounded rectangles with arrows pointing to the buttons and explaining what they did. I like her use of colors, some red, some pink to match her sweatshirt in the images! I like how she did this as one big image per page, so the whole thing is 5 pages long but is just one concept per page so it’s not overwhelming. I like the inventive use of screenshots with real people to make this a great tutorial. If you’ve got people you need to teach and want to introduce new things to them more easily, you might want to head over to clarify-it.com and download a free trial of Clarify and see how much fun it is to help others like Dorothy did! That’s going to wind this up for this week – thanks to Allister and Door and Steven and Knightwise and Steve for doing all the great reviews so I could relax this week! And of course many thanks to our sponsors for helping to pay the bills, the makers of Clarify over at clarify-it.com and Hover for your domain names at hover.com. Don’t forget to send in your Dumb Questions, comments and suggestions by emailing me at allison@podfeet.com, follow me on twitter @podfeet. Check out the NosillaCast Google Plus Community too – lots of fun over there! If you want to join in the fun of the live show, head on over to podfeet.com/live on Sunday nights at 5pm Pacific Time and join the friendly and enthusiastic NosillaCastaways. Thanks for listening, and stay subscribed.